“It was a fantastic opportunity and I plan to share my experiences with my public administration students at Point Park." 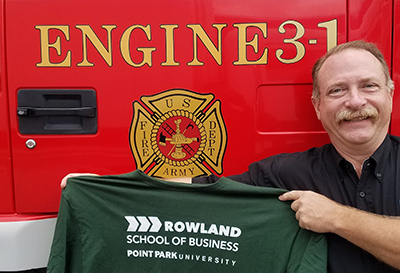 Robert Skertich, Ph.D., associate professor and director of the public administration program at Point Park University, recently spent two weeks in Japan teaching Fire Instructor I and II certification courses at the United States Army Camp in Zama, Japan, located about 25 miles southwest of Toyko. According to Skertich, the 40-hour courses provide certification as Fire Service Instructors, Level I and II, for the National Professional Qualifications Board, or ProBoard. The U.S. Department of Defense requires these certifications for various career paths in fire departments. “I had a great time teaching the fire instructors and learning from them as well. I also learned a lot from Yuko Matsumoto, who has been my interpreter for my trips to Japan,” Skertich said. Skertich added: “It was a fantastic opportunity and I plan to share my experiences with my public administration students at Point Park."